The Samyang 300mm f6.3 Reflex ED UMC CS Micro Four Thirds Fit is a compact, manual focus lens dedicated for the mirroless compact system cameras. The optical structure contains 9 elements arranged in 6 groups, including one ED-type lens ensuring high contrast and effectively preventing chromatic aberration. Weighing only 315g and measuring 73.7 x 64.5mm in size, the Samyang 300mm is the perfect travel companion offering a lot of reach. This prime telephoto lens is ideal for both city and nature photography. 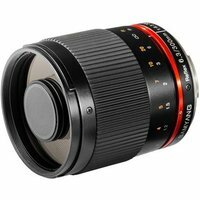 This lens features a Micro Four Thirds fit and is designed to fit the Olympus and Panasonic mirrorless cameras.